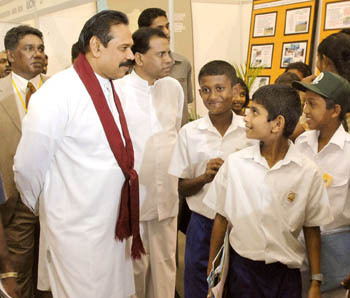 President Mahinda Rajapaksa mingles with children at the Educational and Trade Exhibition organised at the BMICH, Colombo, by the Central Environment Authority to mark its 25th anniversary. Minister Maithripala Sirisena is also in the picture. THE Government yesterday expressed confidence that Security Forces will effectively reach its humanitarian task of opening the Mavilaru anicut as ground troops moved closer to their target clearing a heavy minefield set by the LTTE. THE All Party Representative Committee, comprising delegates from different political parties will meet again on August 8 to formulate a constitutional framework capable of facilitating a peaceful solution to the ethnic conflict. CREDIBLE evidence has emerged that the LTTE are holding about 5,000 children in combat camps. In 2004 alone, the LTTE recruited 1,000 children. According to the latest human rights reports, children abducted from schools and homes are held in LTTE camps where they undergo training in guerilla combat and prepare for deadly missions such as suicide bombings. The "Jathika Saviya" accelerated development programme initiated by President Mahinda Rajapaksa with the twin objectives to uplift the living standards and provide adequate security to the villagers affected by the North-East conflict is set to debut in the Batticaloa district.